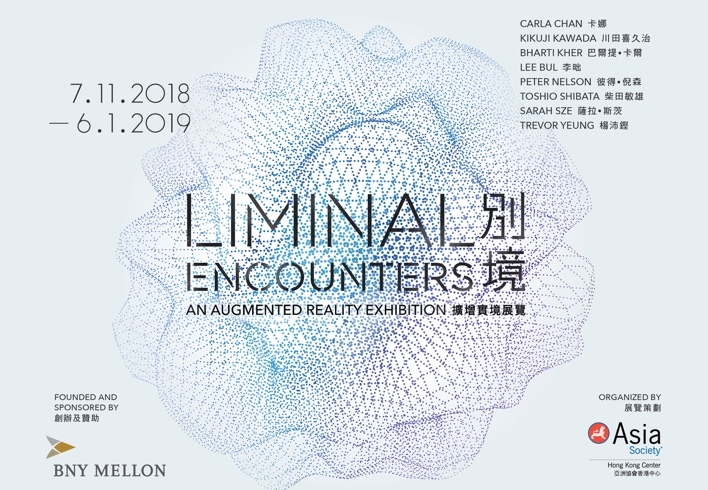 BNY Mellon announces the opening of Liminal Encounters – An Augmented Reality Exhibition at Asia Society Hong Kong Center (ASHK) on view Wednesday, November 7, 2018 to Sunday, January 6, 2019. Liminal Encounters is one of the first outdoor augmented reality art exhibitions in Hong Kong. The exhibition marks the celebration of BNY Mellon’s 60th anniversary in Hong Kong. Breaking away from a traditional gallery setting, visitors are invited on an inspiring art journey outside the museum using technology. Each artwork is viewed at different locations throughout ASHK’s historic heritage complex and has an augmented reality component experienced through the Liminal Encounters BNY Mellon mobile application. The art exhibition features virtually five contemporary artworks selected from the BNY Mellon art collection, alongside three on-site installations commissioned from Hong Kong artists. The title “Liminal Encounters” refers to how each artwork in the exhibition is a unique experience in between physical and virtual worlds. From the BNY Mellon art and artifacts collection, artworks by Kikuji Kawada, Bharti Kher, Lee Bul, Toshio Shibata and Sarah Sze are presented virtually for their resonance with ASHK’s site history, and their response to the site’s contemporary transformation bridging the natural and the man-made. Three local artists, Carla Chan, Peter Nelson and Trevor Yeung, were also invited to create site-specific installations that make use of augmented reality to rethink the impact of technology on our natural environment and daily lives. BNY Mellon’s art collection reflects the company’s heritage, culture and values. It spans four centuries, features artists of more than 30 nationalities, and is on view in 15 countries. BNY Mellon opened its first Asia Pacific Representative Office in Hong Kong in 1958, and since then has added a branch and a locally incorporated investment management entity in the city. As the Asia Pacific Regional Headquarters with around 300 employees, BNY Mellon Hong Kong office provides a suite of investment management and servicing solutions to our clients, including asset servicing, alternative investment services, corporate trust, treasury services, markets, depositary receipts, investment management and wealth management. Asia Society Hong Kong Center actively provides access to art, cultural education and experiences for all audiences. The Center organizes art exhibitions that respond to local contexts with an international outlook and celebrate the convergence of talent in Hong Kong. Since moving into the historic former Explosives Magazine in 2012, the Center presents exhibitions both in its world-class gallery spaces and throughout its outdoor heritage site. The exhibition at Asia Society Hong Kong Center will be open to the public from 11 am to 6 pm, Tuesday to Sunday. Admission is free.